FLAGS FLEW AT half mast across Malta today to mark the funeral of journalist Daphne Caruana Galizia, amid fresh calls for Europe to find those guilty of her brutal murder. The anti-corruption campaigner was laid to rest after a service in Mosta, close to the site where the blogger was blown up in a car bombing in the 16 October attack which made headlines around the world. “We still do not know who killed Daphne,” Archbishop Charles Scicluna told the relatives and friends gathered for the private ceremony. “Whoever took part, I tell you this: however hard you try to evade the justice of men, you will never escape the justice of God,” he said. Caruana Galizia (53) had made repeated and detailed corruption allegations for years against Prime Minister Joseph Muscat’s inner circle and had recently turned her investigative scrutiny on the opposition as well. After her death, her family accused Muscat of creating a culture of impunity that turned Malta into a “mafia island”. Caruana Galizia’s family had asked the Prime Minister, Malta’s president and international media to stay away from the funeral. Crowds gathered outside the Roman Catholic Church after the ceremony broke into applause as her coffin, covered in white flowers, was carried outside by her sons Matthew (31) Andrew (26) and Paul (21). EU Parliament chief Antonio Tajani and the OSCE’s media freedom representative Harlem Desir both paid their respects at the church, while flags outside the European Commission in Brussels flew at half mast. “The right of a journalist to investigate, ask uncomfortable questions and report effectively, is at the heart of our values and needs to be guaranteed at all times,” the European Commission said in a statement. Desir said “no mercy” should be shown to “the perpetrators and masterminds behind this heinous crime”. In the letter sent to commission vice-president Frans Timmermans yesterday, they called for an investigation into the independence of the media in Malta, the “only EU country that has such extensive media ownership by the political parties”. “The eyes of Europe are on the Maltese authorities,” Timmermans said in his reply, calling on them to “leave no stone unturned” in finding out who was behind “this atrocious, barbarous assassination”. Email “Maltese journalist's funeral held after media and politicians told to stay away ”. 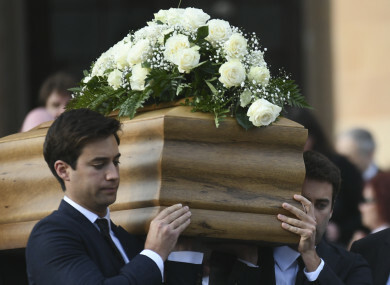 Feedback on “Maltese journalist's funeral held after media and politicians told to stay away ”.